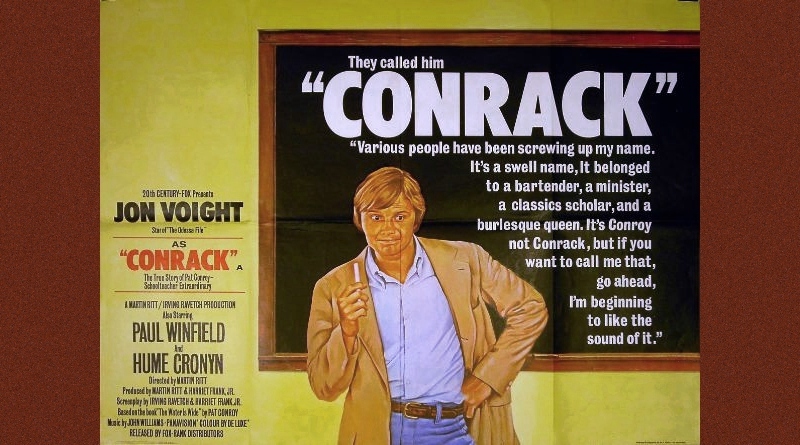 Largely forgotten in the decades following its 1974 release, Martin Ritt's Conrack is one of the better "inspiring teacher" movies in a sub-genre full of entries. 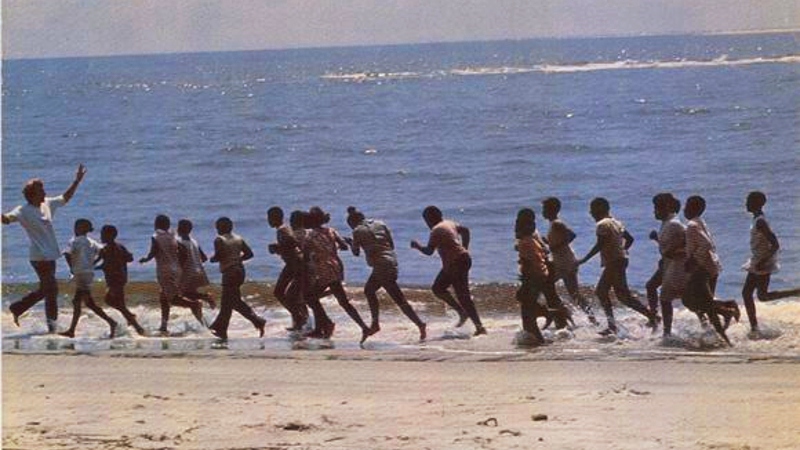 It certainly wasn't the first of its kind: earlier productions like Goodbye Mr. Chips (1939), Blackboard Jungle (1955), Up the Down Staircase and To Sir, With Love (both 1967), among many others, centered around teachers who met plenty of resistance from their students and, in some cases, their administrators. In most cases, we're introduced to a young teacher whose style goes deep against the grain of the school and its policies, for better or for worse...and in the decades since then, this "fish out of water" trope has been beaten to death. Much like several other exceptions, Conrack plays most of its cards right, none more so than the confident central performance of Jon Voight as Pat Conroy, whose idealistic personality ends up complementing the poor, uneducated students of fictional "Yamacraw Island" in South Carolina. Voight's character doesn't so much have a problem with authority as he generally ignores it, much to the approval of the children he takes under his wing. During their eight months together, "Conrack" (a mispronunciation of Conrad's name) exposes the kids to classical music, movies, math, swimming, geography, trick-or-treating and most everything else they've been sheltered from at home. Adapted from teacher and author Pat Conroy's 1972 novel The Water is Wide, this semi-biographical account of Conroy's educational exploits gives Voight an opportunity to carry Conrack after his Oscar nominations for Midnight Cowboy and Deliverance. Supporting performances are also excellent. The late Madge Sinclair shines as Mrs. Scott, the principal whose stern, distanced approach stands in stark contrast to Conroy's wide-eyed, spontaneous personality. 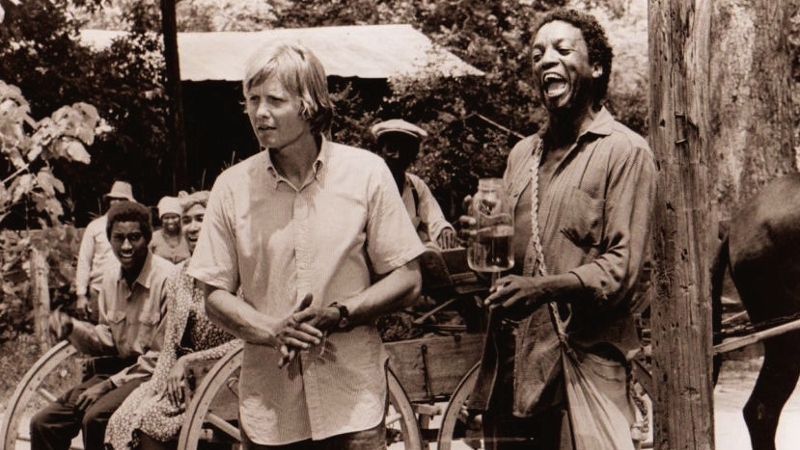 The late Paul Winfield does a fine job with the mostly thankless role of "Mad Billy", a local widower who trades homemade whiskey for reading lessons; unfortunately, this second-tier relationship is undercooked and eventually abandoned. Hume Cronyn (who, strangely enough, almost outlived them both) portrays Mr. Skeffington, the superintendent and Conrack's most blatant antagonist. Of course, the students also deserve a mention: plucked from the nearby C.B. Greer Elementary School, they're perfectly believable and, with few exceptions, provide a seamless window into Conrack's particular world. Having never been released on DVD, Twilight Time's new Blu-ray edition of Conrack should thrill fans still clutching on to faded, worn-out VHS tapes. The solid A/V presentation is paired with an engaging audio commentary by two Twilight regulars and includes other studio-specific supplements. Though author Pat Conroy was unfortunately not involved with this release in any obvious manner, it's still a strong package that appropriately celebrates the film's 40th anniversary. Presented in its original 2.35:1 aspect ratio, this 1080p transfer is a fairly solid effort that presents Conrack in the best possible light. Having never been afforded a DVD release, the Blu-ray allows for a modest amount of image detail, good color saturation, light film grain and other pleasing textures along the way. Black levels fluctuate and there's a small amount of flicker on certain occasions, while trace amounts of edge enhancement and contrast boosting could also be spotted at times. But this is a largely pleasing effort and perfectly watchable from start to finish; as mentioned before, Conrack was not a slick, glossy production and fits in perfectly well with other low-budget releases from that era. Presented in DTS-HD Master Audio Mono (which my receiver identified as 2.0, but it's definitely a one-channel source), this is a thin presentation with issues tied to the source material. The dialogue can be problematic at times, as this low-budget production probably didn't have the time or resources for extensive ADR; as a result, some of the conversations are a little tough to make out. If you're fluent in multiple Southern dialects you might have an easier time, but this Yankee had to replay a few scenes along the way. John Williams' score also lacks punch and dynamic range, although an included Isolated Score and Effects Track boosts it to a more robust stereo presentation. Unfortunately, no optional subtitles and/or captions are offered during the film, unlike most of Twilight Time's output. An unfortunate oversight! Seen below, the menu designs are plain but perfectly functional, plus they load pretty quickly. This one-disc release is housed in a standard keepcase, adorned with colorful artwork and a nice little Booklet adorned with production stills, vintage promotional artwork and liner notes by Twilight Time regular Julie Kirgo. Simple, effective and appropriate. The main extra is a new Audio Commentary with Nick Redman and Paul Seydor; both Twilight Time regulars once again do a terrific job of filling the session with plenty of production tidbits, personal reflections and other insights. Seydor's comments are especially valuable: as a former teacher, his first-hand experience with Pat Conroy's source novel as part of his curriculum allows for plenty of interesting comparisons to the film itself. From the different themes of each version (hinted at by their titles) to the film's playful editing, many topics are discussed along the way. Die-hard fans and new viewers alike should enjoy this track, especially since obscure, 40 year-old catalog titles rarely get such attention. The remaining extras are less substantial but still worth a mention. These include the aforementioned feature-length Isolated Score and Effects Track (smartly presented in DTS-HD Master Audio 2.0), as well as the Theatrical Trailer and an on-screen listing of the Twilight Time Catalog. Like the film, no optional subtitles are included during these extras. 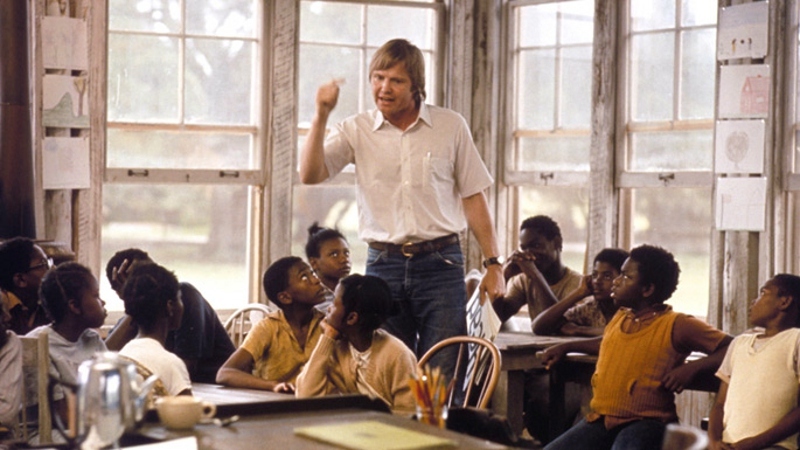 Anchored by a strong source novel and Jon Voight's confident lead performance, Martin Ritt's Conrack helped to refine a blueprint for the "inspiring teacher" trope that influenced countless films in its wake. Featuring a handful of excellent supporting performances, an atypical John Williams score and a memorable, sun-drenched backdrop, this character-driven film has aged perfectly well during the last 40 years. Twilight Time's Blu-ray offers a solid amount of support, including a decent A/V presentation and an excellent audio commentary that should enhance your appreciation of this overlooked gem. Don't let the ticket price scare you off: this limited edition disc is worth the cash. Recommended.